This Dust Filter Pack for the NetShelter CX allows the user to reduce the airborne particles entering the enclosure. The reticulated plastic filter material is washable and easily removed/replaced. Using the Dust Filter Pack on the NetShelter CX reduces the risk of dust related equipment issues, such as overheating, system failure, and permanent data loss. Easily Washed - No purchasing of additional filters required. Simply remove the existing filter material, wash it in warm running water, and replace it back in its metal cassette. 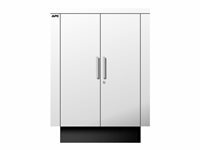 Increases IP Specification - Ingress Protection (IP) rating increases from IP44 to IP54 by installing the Dust Filter Kit on to the CX enclosures. This can be beneficial in certain cases such as for Government, Health & Education sectors. Reduce dust related equipment issues - Protecting the equipment inside the CX from airborne contaminants such as dust reduces the risk of related equipment issues, such as overheating, system failure, and permanent data loss. Added safety - Use the Bolt-down kit to provide added safety in dynamic environments (such as on board a ship) or in seismically active regions. Added security - Ensure your CX cannot easily be moved or stolen. This dust filter pack for the NetShelter CX allows the user to reduce the airborne particles entering the enclosure. The reticulated plastic filter material is washable and easily removed/replaced. Using the dust filter pack on the NetShelter CX increases the Ingress Protection (IP) rating of the enclosure from IP44 to IP54 and reduces the risk of dust related equipment issues, such as overheating, system failure, and permanent data loss. 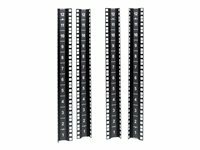 Quick install vertical mounting rail kit - Using pre-existing holes and supplied hardware, these vertical mounting rails fit quickly and conveniently into place, transforming the CX Mini into a 12U Rack Enclosure. 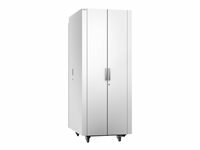 Includes: Casters, Installation guide, Key(s), Leveling feet, Rack Power Distribution Unit (PDU), Side panels. NetShelter CX 18U in White Intl. Specialized enclosures with integrated cooling, noise dampening, and power distribution for server and network applications in office environments. 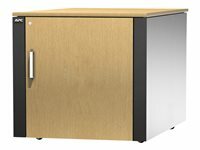 AR4018IX431 Features Acoustic foam lining for noise dampening - Superior noise reduction of installed IT equipment allowing the enclosure to be placed in a quiet environment. 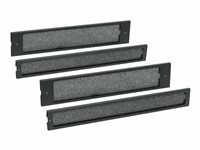 Adjustable equipment mounting rails - The equipment mounting rails, front and rear, are fully adjustable for various mounting depths, for rear-facing equipment mounting or additional clearance from the front door. 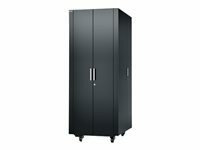 Maximum rack depth 88 cm/34.6 in. Minimum rack depth 12 cm/4.7 in. Six vertical 0U accessory channels - Provides multiple mounting locations for cable management accessories and rack PDUs without using critical equipment space. 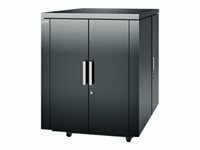 NetShelter CX 24U in colour Black Intl. 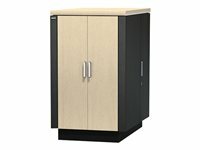 NetShelter CX 24U in colour Oak Grey Intl. 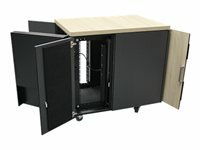 Specialized enclosures with integrated cooling, noise dampening, and power distribution for server and network applications in office environments. 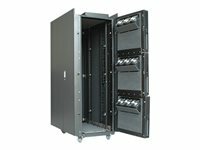 Four vertical 0U accessory channels and cable containment brackets - Provides multiple mounting locations for cable management accessories and rack PDUs without using critical equipment space. NetShelter CX enclosures are specialized enclosures with integrated cooling, noise dampening, and power distribution for server and network applications in office environments. 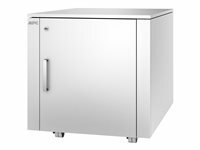 The enclosures provide storage for industry-standard (EIA-310), 19 in. 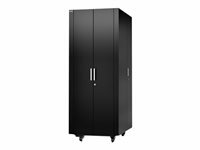 rack-mount hardware, which includes servers, voice, data, networking, internetworking, and Schneider Electric power protection equipment. 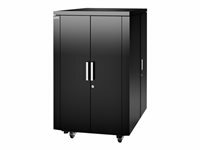 NetShelter CX 38U Secure Soundproof Server Room in a Box Enclosure International Specialized enclosures with integrated cooling, noise dampening, and power distribution for server and network applications in office environments.